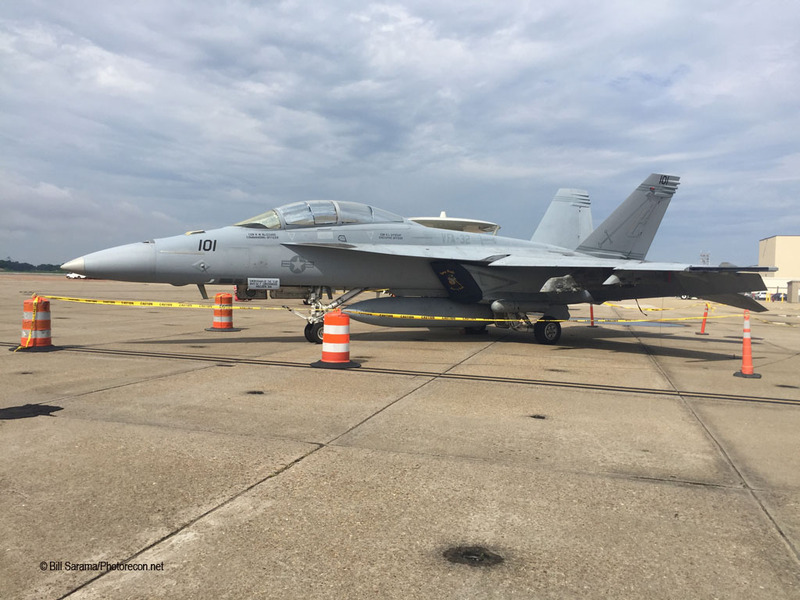 Naval Air Station “Chambers Field”, a contiguous part of the massive Naval Station Norfolk (NAVSTANOR), celebrated its 100th Anniversary by having an Air Show on Saturday, July 15th, 2017. It was a good but limited air show only open to the public from 11:00 AM until 4:00 PM. It was a one day event with limited advertising or announcements with no Blue Angels, which reduced pubic attendance to, I’d estimate, no more than 5,000. And there was 4 hours of flying so if you really liked Naval Aviation it was the place to be on a sunny Saturday morning in July! 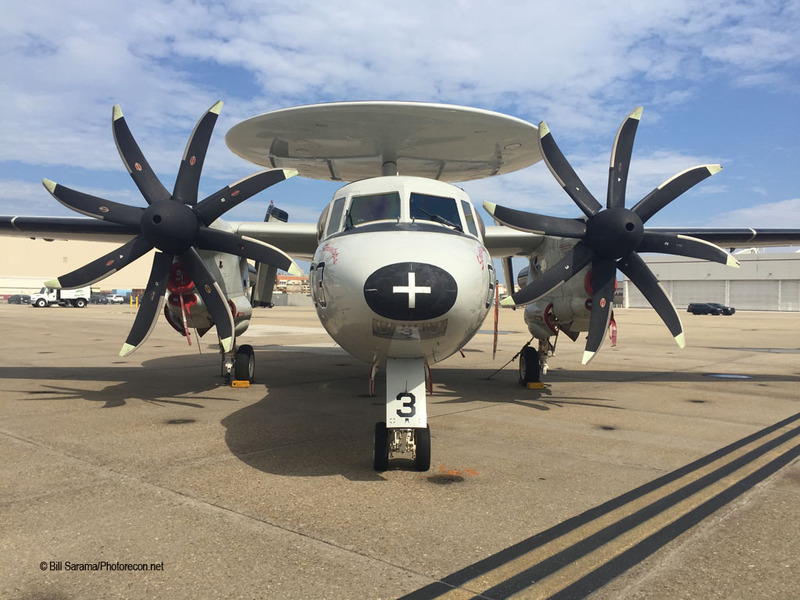 The Public Affairs Office, specifically Senior PAO Kathy Wirfel, was very cooperative and escorted a small convoy of only six media cars from the off-base Visitors Center to the flightline at 9:00 AM. 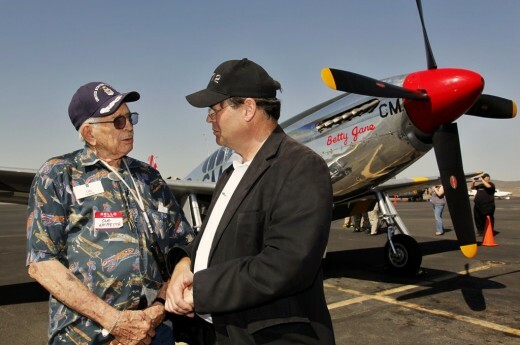 Once on the show flightline, Press was allowed free ramp access until the public started trickling in at 11:00 AM. 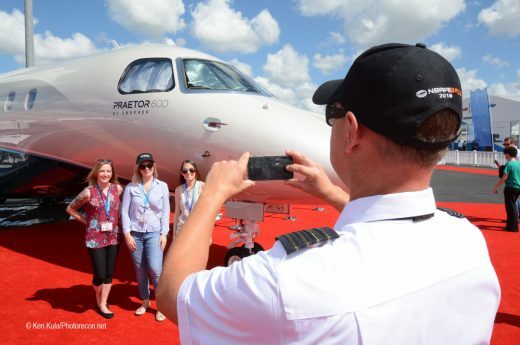 With the low attendance it made for a nice day on the ramp without the 200,000 plane-crazed plane chasers we are accustomed to seeing at the big shows like Oceana or McGuire. Counting both the Hot Ramp and the Static Ramp, there were 27 aircraft on hand with about 6 that rolled in from remote parking spots to participate in the flying. 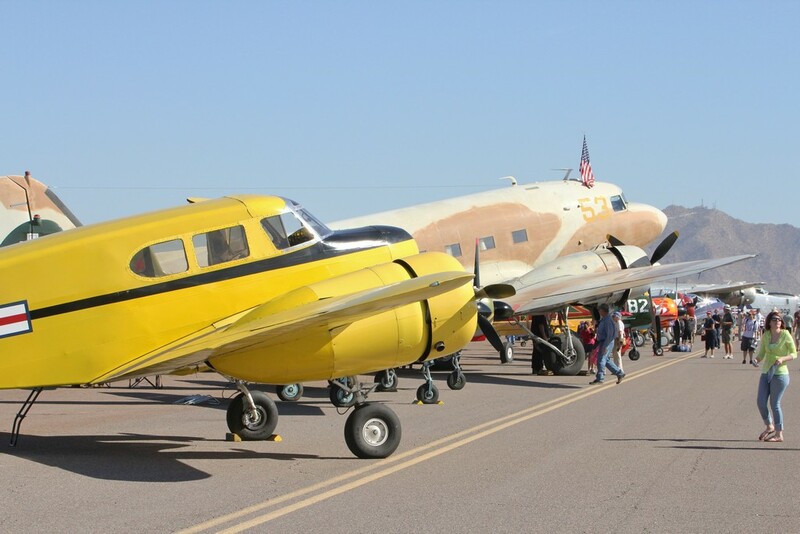 It was a nice mix of warbirds and current Naval Aviation. 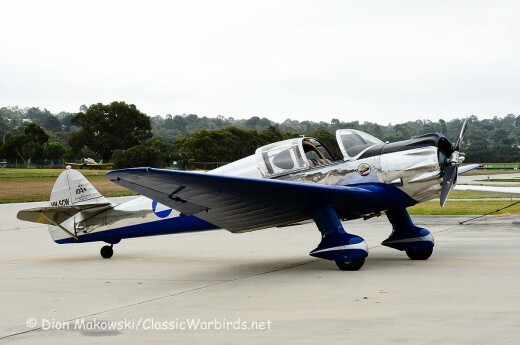 We certainly tip our hats to Jerry Yagen for flying in a nice collection of warbirds from his Military Aviation Museum over at nearby Princess Anne Road. 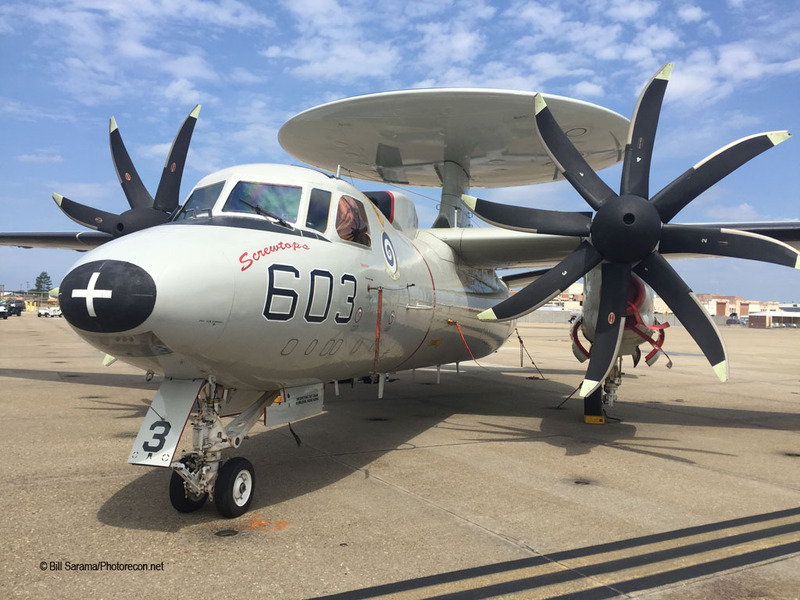 The statics were nicely spread out over the massive E-2C/D and C-2A ramp at Chambers. 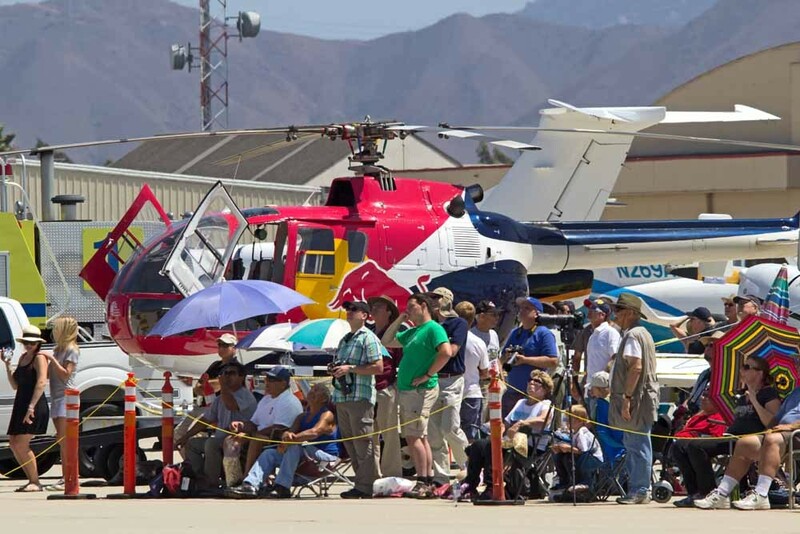 Everyone really got their cardiac exercise in by walking around the spread-out static aircraft displays. This was really the “Secret Public Air Show” that nobody came to. But it was still fun! As you walked in from the public parking area, actually quite close to all the planes, if you walked first to the right side wire you came to the Hot Ramp not too far away. 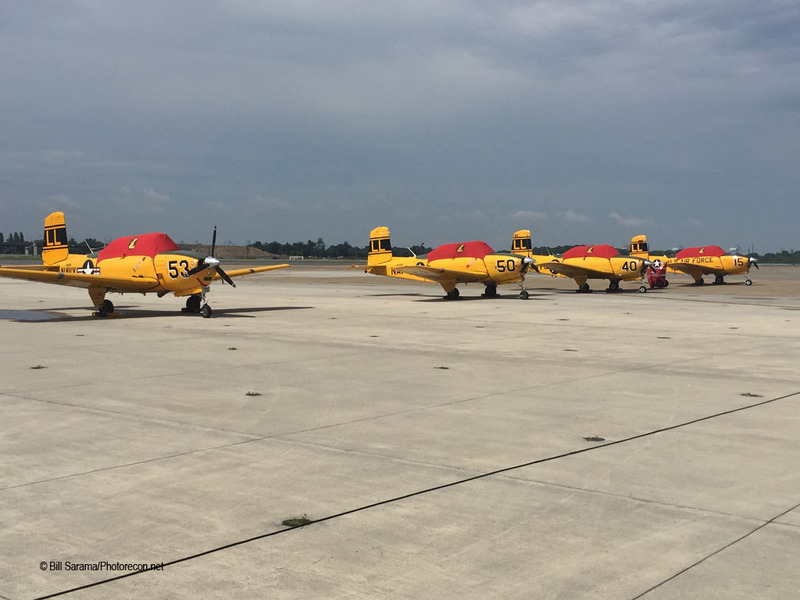 The first group was the “Lima-Lima Flight” demo team, usually a 6-ship made up of bright yellow T-34 Mentors, but this time they came in with a flight of 4 Mentors. The name “Lima-Lima” derives from the FAA identifier of the field where the team is based. Naperville Aero Club (LL-10) is an airport residential community near Chicago with 100 homes connected to its two runways with taxiways behind the homes. 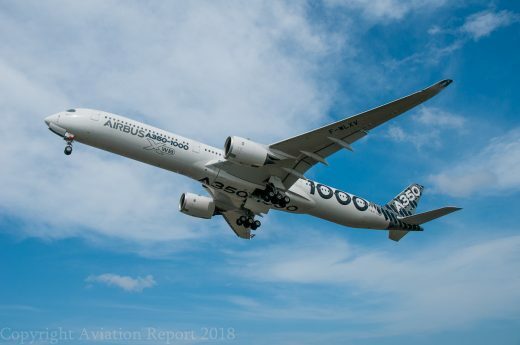 How’s that for being “Plane Crazy”? “Honey, just go park your car next to my T-34”. Next to the T-34’s were a cluster of warbirds that came over from Jerry Yagen’s nearby Military Aviation Museum (originally called “The Fighter Factory”): a blue Goodyear FG-1D Corsair, a Grumman FM-2 Wildcat, a beautiful Consolidated PBY’S-5A Catalina, a Navy North American AT-28D Trojan, and a white MX2 stunt plane (not Jerry’s). Back by a protected hanger were more warbirds: a CAF Nakajima B5N “Kate”Japanese replica torpedo bomber, a CAF Curtiss SB2C Helldiver, and a MAM yellow Stearman PT-17 Kaydet. 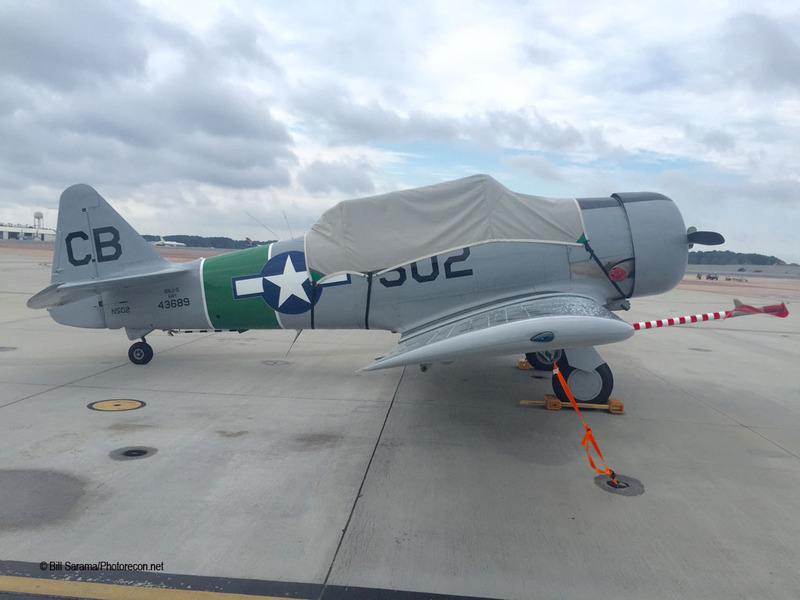 Along the public static ramp were more warbirds: the MAM olive drab Curtiss P-40E Kittyhawk with a shark nose, a CAF Grumman TBM-3E Avenger with a “Doris Mae” nose art, and a North American SNJ-5 (T-6) Texan “502” in Pensacola training colors. 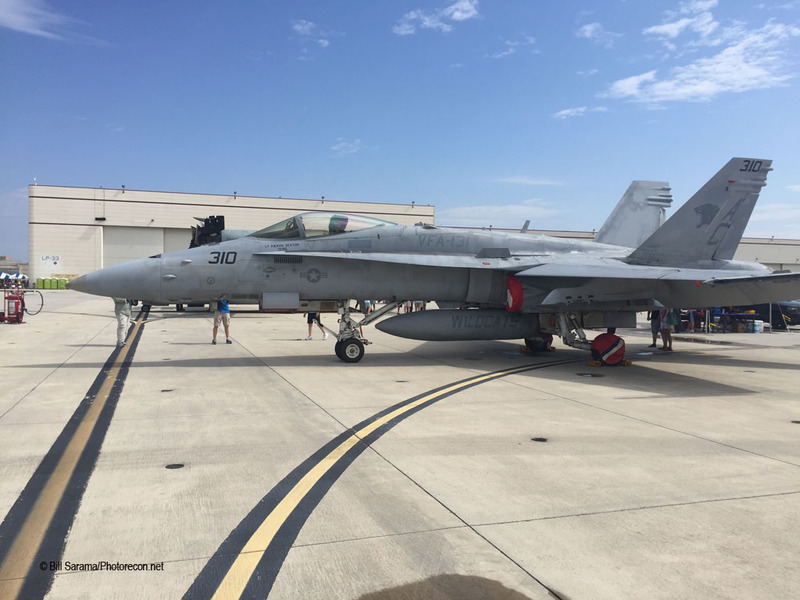 Then the Flightline had a nice collection current Navy aircraft found around the Norfolk Area: a F/A-18C Hornet from the Dwight D. Eisenhower from VFA-131 “Wildcats” over at Oceana; an MV-22B Osprey tilt-rotor from USMC Tiltrotor Squadron VMM-744 “Wild Goose” MQ Reserve Squadron recently based here at NS Norfolk; a C-2A COD Grumman Greyhound from VRC-40 “Rawhides” out of NS Norfolk; an MH-53E Sea Dragon Helicopter Mine Detection and Countermeasures Squadron from HM-14 “Vanguard” out of NS Norfolk; an MH-60S Seahawk helo from HSC-5 “Night Dippers”, a Helicopter Sea Combat Squadron and ASW unit based at NS Norfolk; an MH-60S Seahawk from HSC-2 “Fleet Angels” from NS Norfolk; an E-2C Hawkeye from the Dwight D. Eisenhower from VAW-123 “Screwtops” out of NS Norfolk; an F/A-18F Super Hornet from the Dwight D. Eisenhower from VFA-32 “Swordsmen” with “Gypsy Pride” nose art and CAG Bird in CO colors and another E-2C Hawkeye also from VAW-123 “Screwtops” with “Don’t Tread On Me” and “Shooter” nose art. 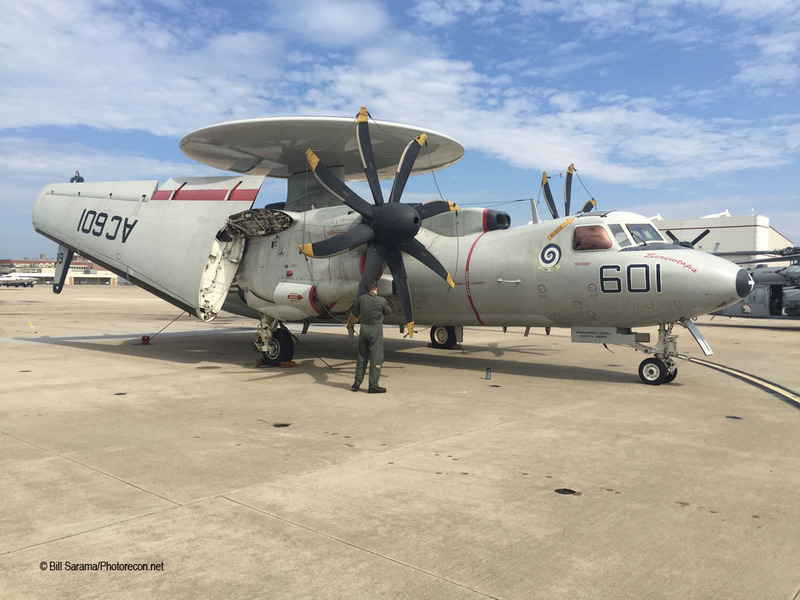 The “Screwtops” are noted for their spiral design on the tops of their squadron rotating Rotodomes. 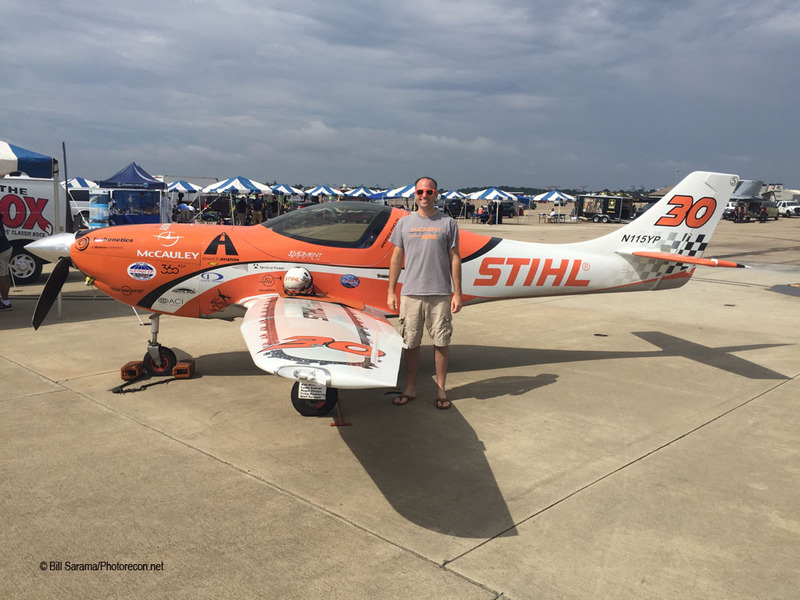 Finally the static line ended with some unusual planes: the Team STHIL Air Racing Plane, a Lancair Super Legacy carbon fiber racing plane with a 400 mph and 600 hp engine rated at 4.5+Gs and 2.2-Gs, owned by pilot Andrew Findlay; a CAP large single-engine 8-passenger GippsAero GA-8 AirVan and finally CAP Cessna C-182. I think that all adds up to 27 planes. 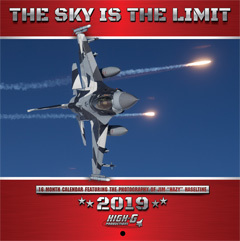 The NAS Chambers Field Flying Show was scheduled to start at 1200. 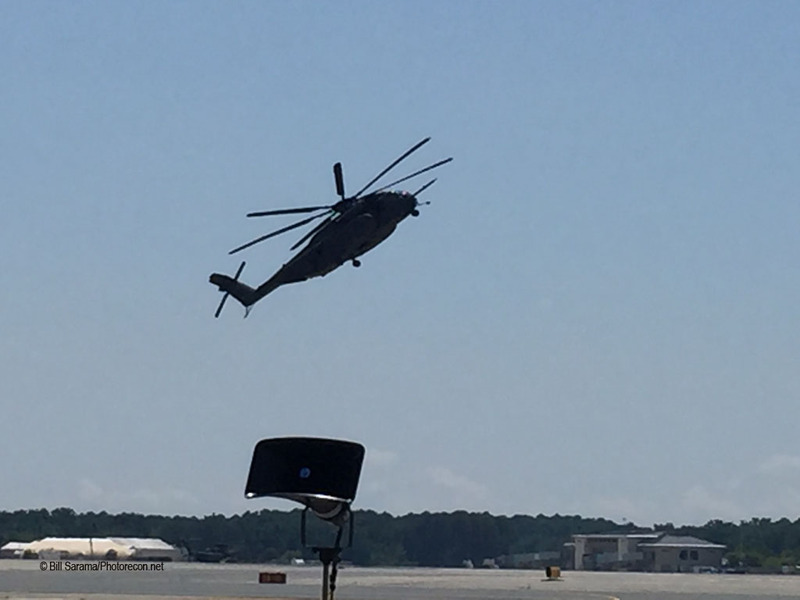 At 1145 an MH-53E from HM-14 “Vanguard” lifted off as the Jump Plane for the “Black Daggers” Opening Flag Drop. Next up at 1149 was Gary Ward in his white and orange MX-2 aerobatic plane positioning to do “Flag Circles” around the jumper later. At 1150 two E-2C’s and one C-2A took off remotely to hold to the south. Then Gary Ward did a pre-show 3-minute “Teaser” in his MX-2. The “Black Daggers” next did a Streamer Drop from 8,000 in a hazy but blue sky. Then it was High Noon and we started up. 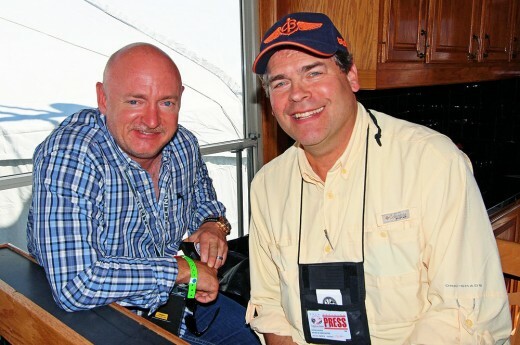 Veteran show announcer Rob Reider welcomed NS Norfolk CO Capt. Rick McDonald who gave a welcome, praised NAVSTANOR in its 100 Year Celebration and gave a quick history of the Base, and introduced the Black Daggers who first did a 6-man Team Drop and followed by the US Flag Jumper. Coleen Shook sang the National Anthem and Gary Ward flew circles around the Flag Jumper. Standard Stuff but still pretty patriotic to watch. After the Flag Drop, the fixed wing birds came back for an opening flyover with an E-2D Hawkeye, and E-2C Hawkeye and a C-2A Greyhound in the slot position for a series of low passes, landing bolters and finally sequenced carrier landing approach with a carrier break, calling the ball, hitting the Number 3 and a clean trap. They then taxied back and folded their wings in front of the crowd line. 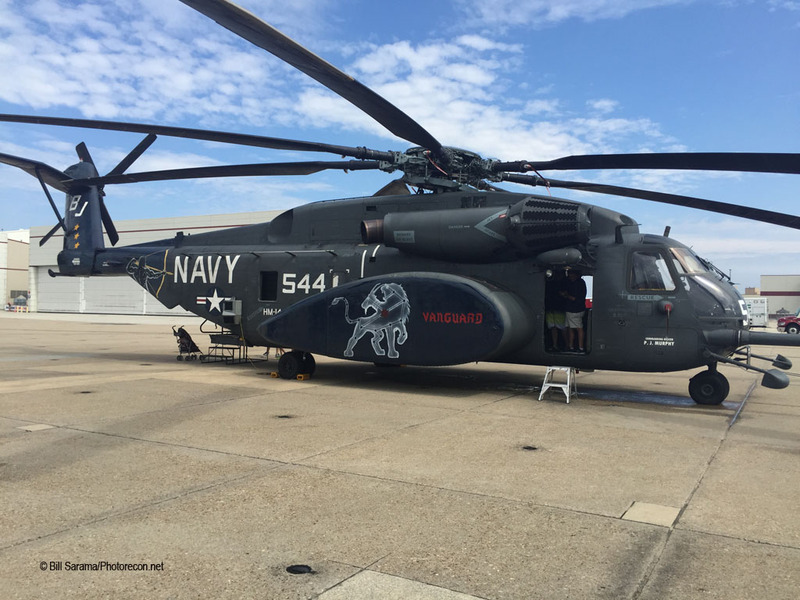 The MH-53E Jump Plane came back next and demonstrated its full operational capabilities: a sideways hover, reverse, vertical, touchdown, max performance liftoff with a tight bank and a final landing. 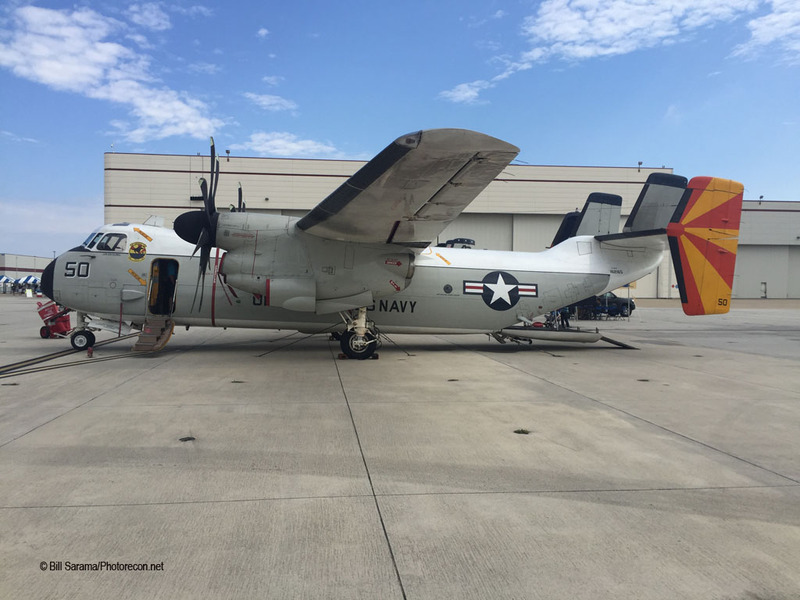 Noted was that the tail folds for carrier storage, the rotor blades can change pitch, there is a needle-nose probe for an air-to-air refueling from KC-130T Tanker with a “probe-and-drogue” basket funnel receptacle for a wet or dry plug. 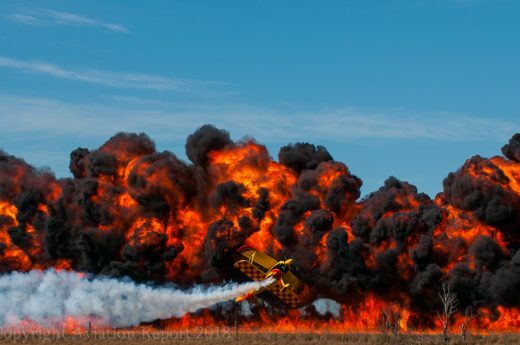 The Navy yellow Boeing N2S Stearman Kaydet from MAM next did a short demo. The MAM Grumman FM-2 Wildcat, an improved version of the earlier F4F Wildcat, was up next for his demo. It was noted that this same aircraft was based in WW2 at Creeds OLF and Pungo OLF near the current Military Aviation Museum on Princess Anne Road. The T-28 Trojan, the TBM-3 Avenger, the FM- 2 Wildcat and the four Lima-Lima T-34’s all went up next for a remote hold. 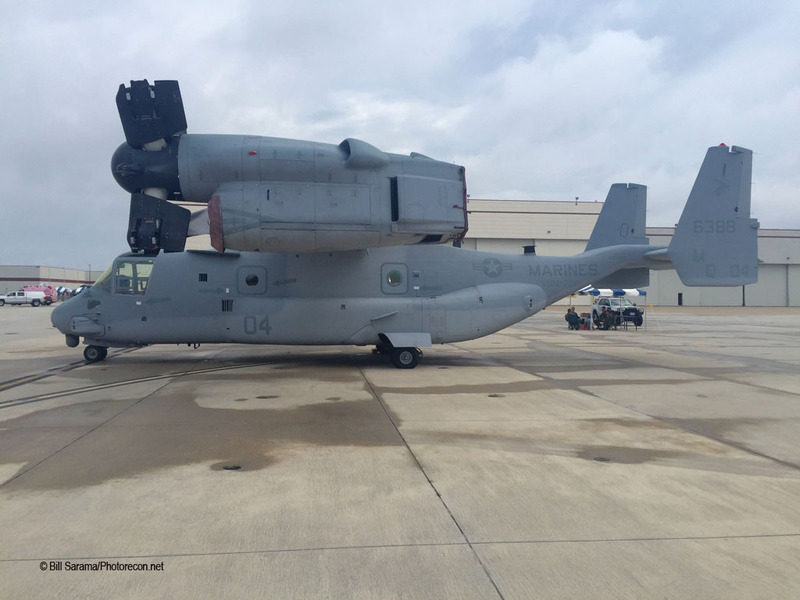 The MV-22B Osprey, the Tiltrotor that recently replaced all the CH-46 “Phrogs”, did a low demo followed by Joe Edwards, an actual NASA Astronaut, coming in to do a demo with his T-28 Trojan from MAM. 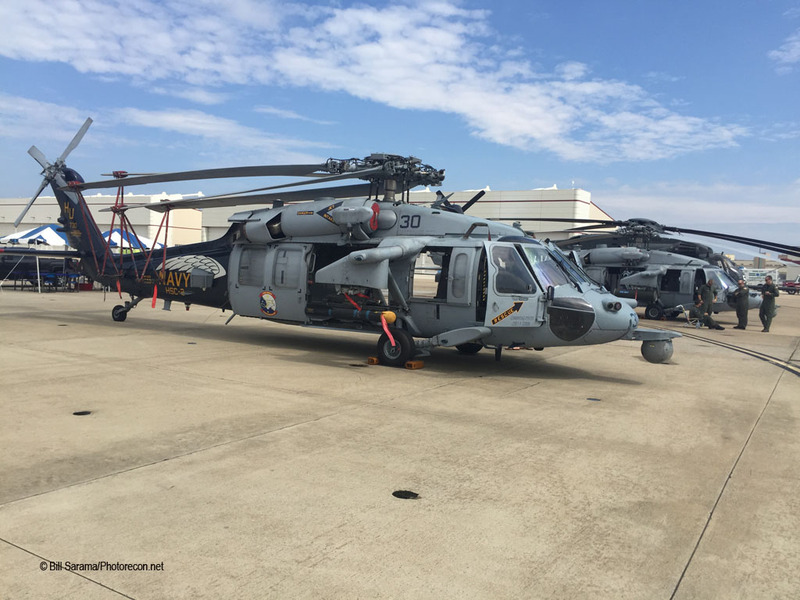 Two MH-60R Seahawks, sometimes called MH-60S Knighthawks, from HSC-7 “Dusty Dogs”, a special night ops helo with FLIR, thermal imaging, nose cameras, and all-weather capabilities, next did an actual Special Ops ground assault insertion demonstration against some bad guys in an enemy van. 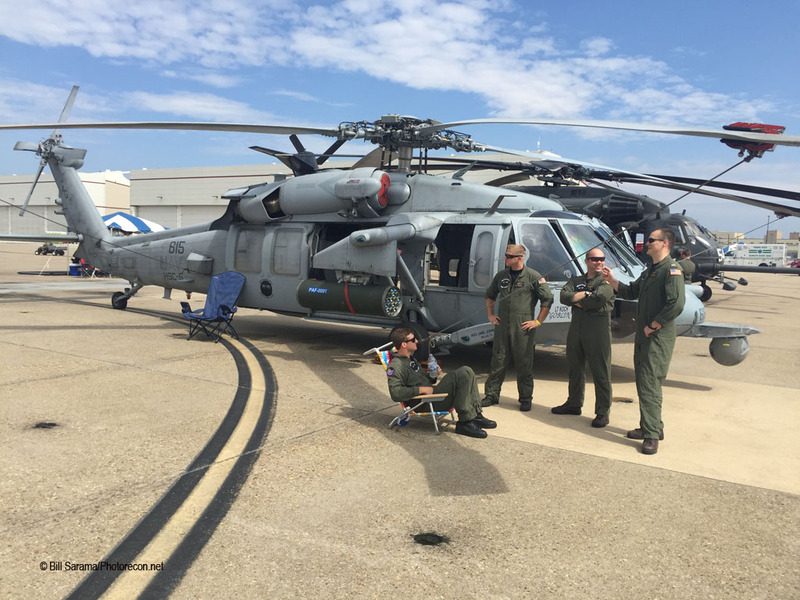 The Knighthawk typically has 2 pilots, 2 armed rescue swimmers, and 2 assault troops on board. They did an impressive tight 2-ship approach on the objective and successfully “captured” the two bad guys. The MAM PBY-5 Catalina was up next for some flyovers. The PBY’s were based here at the “Willoby Spit” seaplane ramps where the NAS helos are now based. 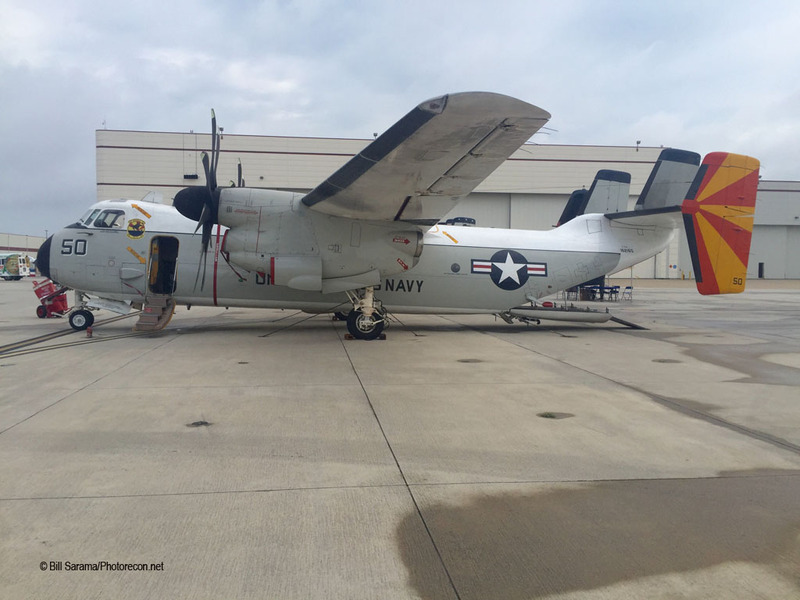 Jerry Yagen’s crew did a beautiful job in restoring this seaplane. The FM2 from OLF Pungo next joined up with the PBY for some tight flyovers – quite a sight. The PBY was famous for finding the Jap Fleet in the Battle of Midway early in the Pacific War. They were also known as “Dumbos” when they rescued many a downed pilot with their unique ability to land in rough water. Next the MH-53E rolled in pretty close to the crowd line to pick up the Black Daggers for a mass combat assault. This time the Daggers went up in full battle dress with M-4’s, Special Ops face camo, body armor and dangling ruck sacks. Just before they hit the ground, they dangle the ruck sacks so as to not impede their landing. Really impressive! The Daggers needed a low drop this time due to a developing cloud deck at 2:00 PM. After they completed the assault demo, they walked into the crowd for photo ops with the kids. The MH-53E Jump Plane recovered near the crowd line again. 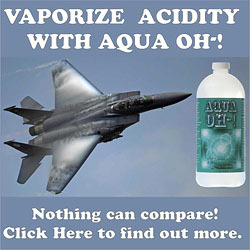 Gary Ward, amazingly spry at 76 years old, took his MX-2 up again for his full demo. 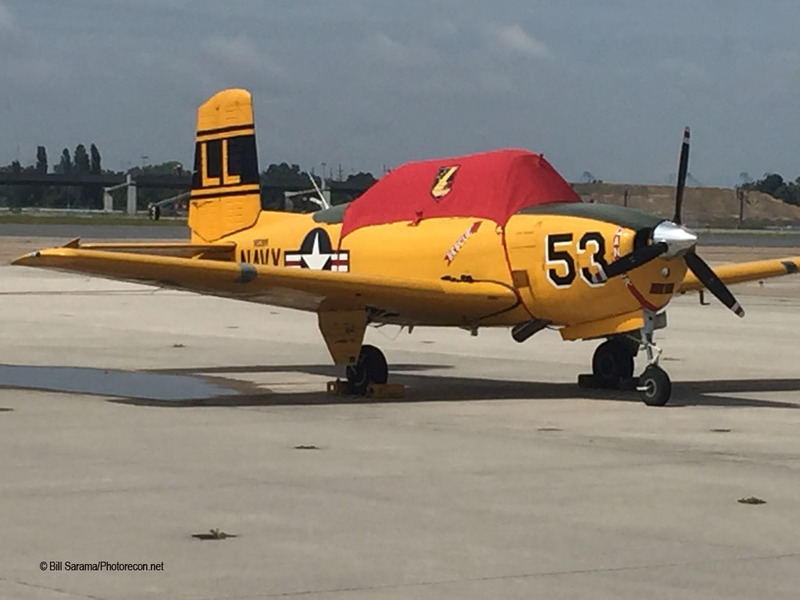 Lima-Lima came back from their long holding pattern somewhere – maybe they landed at Fentress for a coffee break, who knows – and they did their full demo with their four yellow T-34 Mentors. 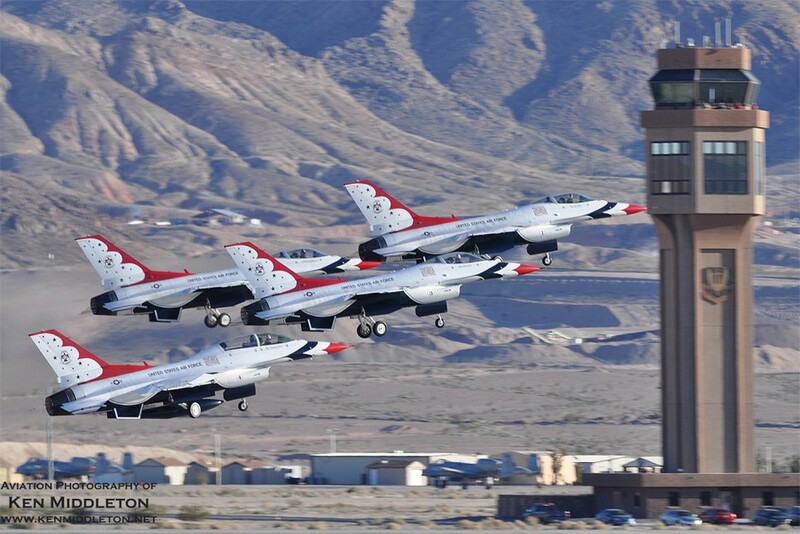 They did a series of 2-ship and 4-ship routines, a “Missing Man” in honor of our military fallen heroes, and finally a formation landing and a tight diamond taxi to their ramp spot. Their demo music was so patriotic with Neil Diamond’s “We’re Comin’ To America”. 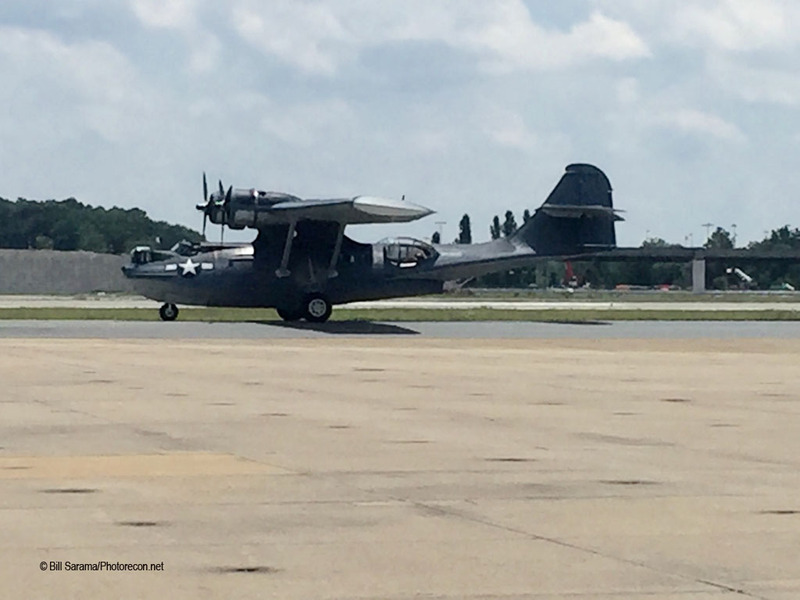 Because of approaching thunderstorms, all of the Navy warbirds left early to get back home to the Military Aviation Museum in Pungo to the east. The problem is that MAM is a grass strip and is not too good in the rain. 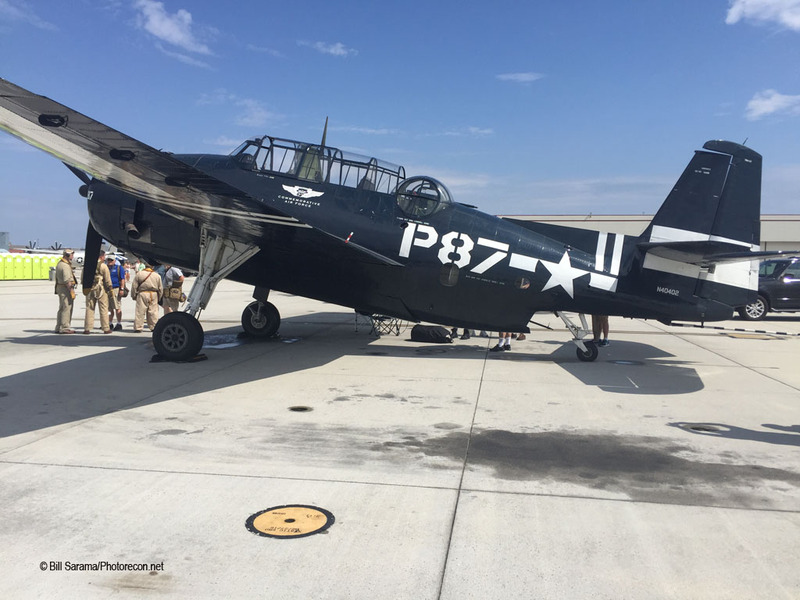 That departure was a show in itself: The Corsair, the Wildcat, the Trojan, the Avenger, the Skyraider, the Texan, the Stearman and the PBY Catalina. That departure was kind of like CAF”s “Prowlers of the Pacific” show! It started raining at 3:15… but it wasn’t over!!! Four F/A-18’s we’re inbound from NAS Oceana. Hornets never worry about a little rain! There were two C and D’s and two E and F’s from VFA-131, Strike Fighter Squadron 131, “Wildcats”, Call Sign “Cougar”. No Blue Angels today? No problem! The “Wildcats are inbound on burner. 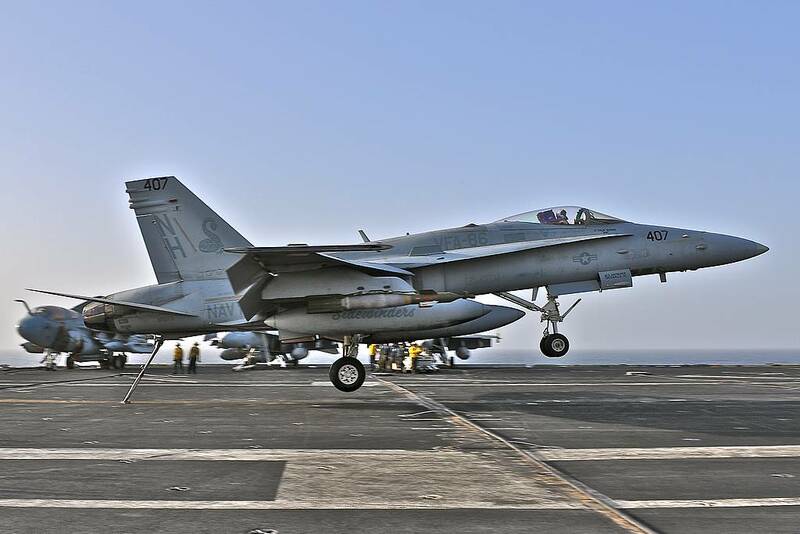 The music changes to “Hells Bells” by AC/DC, real loud, and they come in for a line-abreast carrier break in ear-spliting full burner, then a dirty pass, then touch-and-go bolters, and finally a “call the ball” LSO guided 3-wire trap with a clear deck just like on the IKE. Then, after a 4-ship in-line slow taxi past the crowd line, the Hornets split into two pairs each to set up for a 2-ship formation take-off at each end of 10-28, 2 at the south end and 2 at the north end for a simulated burner Cat Launch in opposite directions, each jet with 5-second separation, with a max-climb departure demo!! Time to get back to Oceana – about 2 minutes away! And the Chambers Field “Secret Air Show” was over! Happy 100th Birthday CHAMBERS FIELD!